Enclosure: An all glass 20 gallon aquarium is suffecient for these tree frogs. A standard screen top is recommended so that proper ventalation will be achieved. Coconut husk “soil” mixed with moss is recommended because they will need a high humidity level. Provide plenty of branches and artificial plant so they have enough hiding spots and to replicate their natural environment. Heating and Lighting: These tree frogs dont need a very hot enclosure. Heating set from 75F to 84F degrees will be sufficient. Avoid temperatures from exceeding 85F degrees. If you prefer UV lighting, tropical 5.0 bulbs will be fine. Humidity: Keep humidity levels above 60%. Using a spray bottle multiple times a day or investing in a automatic misting system. Avoid soaked substrate and “fluff” the substrate every once in a while to help prevent mold from forming. 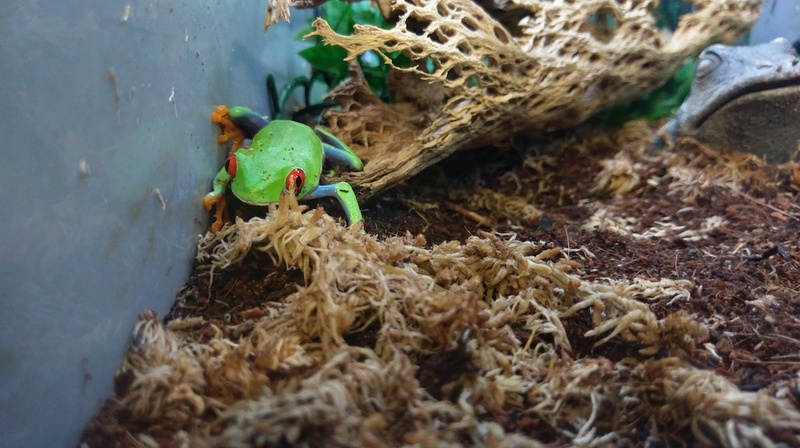 Diet: Red Eyed Tree Frogs are insectivores and will eat crickets and dubia cockroaches for their whole life. If mealworms are given, make sure they are small and that the frog doesn’t have to struggle to eat them. Calcium supplements are recommended a few times a week. Lifespan: Up to 5 years with proper care and diet.